Welcome to the fifth issue of LABEL ALERT EXTRA - Audit Process, Data & Suppliers, a practical implementation guide to navigating Nutrition Label Reform. After a year digesting the new Nutrition final rule, we are back in force with the rest of our series to help you transition to the new Nutrition Facts panel. After creating thousands of nutrition panels last year, Prime Label has distilled its expertise on best practices. If you haven't yet started, now is a critical time, as the new compliance date has just been tentatively declared for January 2020 by the new FDA Commissioner. Feel free to forward this newsletter to your team members who will be instrumental to your success as you navigate this journey together. Download our complimentary Style Guide. Be sure to read Step 1, Step 2, Step 3 and Step 4 if you haven't already, and stay tuned for our 6th installment next time: Scope Resources & Costs. 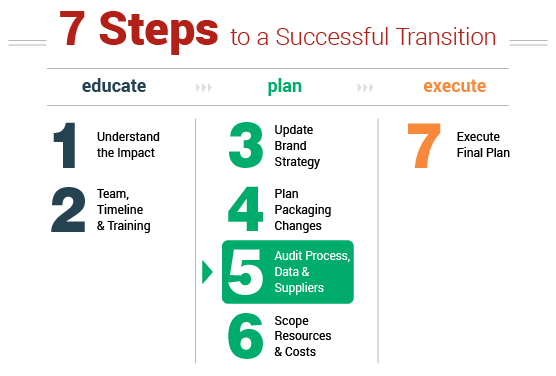 effective transition is to audit your processes, data and suppliers - first by understanding what your risk areas are, then by establishing checkpoints and analyses across your product sets and supplier documentation. Click the video link above to view a brief overview of these topics. PLC and sgsco are ready to support you with regulatory, design & pre-press services that help you plan packaging changes across your enterprise. Come to our Nutrition Label Reform training October 25th in Chicago where we have two tracks - one for technical (regulatory and R&D) and a second for professional (marketing and management). Added Sugar vs Fruit: What's the Difference?